Product Description It is ideal for playing basketball outdoors with this full size basketball hoop. The height of the pole and the rim can both be adjusted. 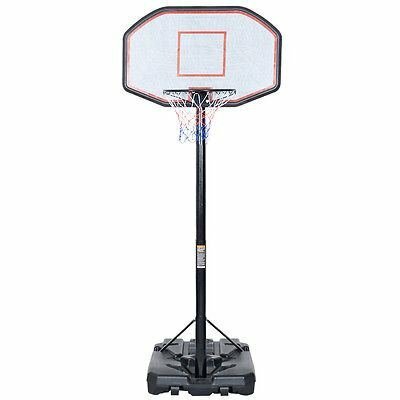 This item is perfect for playing basketball with your neighbors, friends or family outdoor or indoor due to its easy portability with the attached wheels. The base can be filled with 243 lbs water and 265 lbs sands to keep it upright and stable. To enjoy your energetic and safe sports, choose this without hesitation! Notes: When adjusting the height, the holes (4 in the poles and 5 in the rim bracket) need to be aligned to the rotary knobs. If you have any questions about this product by Portable Basketball Backboards, contact us by completing and submitting the form below. If you are looking for a specif part number, please include it with your message.